Dr. Edward Stonestreet graduated McDonald High School in 1999 before attending Bowling Green State University for his undergraduate education. Dr. Stonestreet attended dental school at The Ohio State University College of Dentistry and graduated with his DDS in 2007. "I love meeting and working with all of the different people who come to our dental office. There is always a new challenge and something new to learn in dentistry." When Dr. Stonestreet enjoys his free time, you can find him running, skiing, and enjoying quality family time. Sally, Connie, Fran, and Dr. Tom made me feel like a member of their family, NOT JUST the next patient. They were all concerned about my dental care and provided assurance through out the appointment. I have a life-time of various dental work accomplished. This week ( 2 visits) I had both my six-month cleaning, annual x-rays and a small tooth extracted. I was treated like I was the only one in their care. While my tooth gave Dr. Tom a challenge, he worked at it with a very high level of professional and personal care. 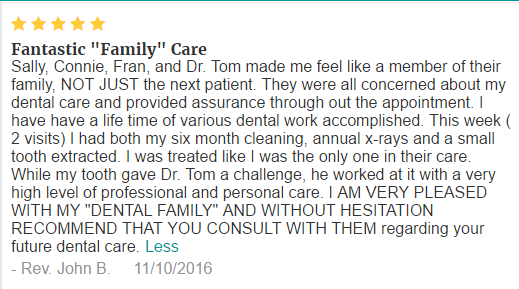 I AM VERY PLEASED WITH MY "DENTAL FAMILY" AND WITHOUT HESITATION RECOMMEND THAT YOU CONSULT WITH THEM regarding your future dental care.